Manny Pacquiao has announced he is taking legal action against former promoter Bob Arum of Top Rank for unpaid broadcast fees. 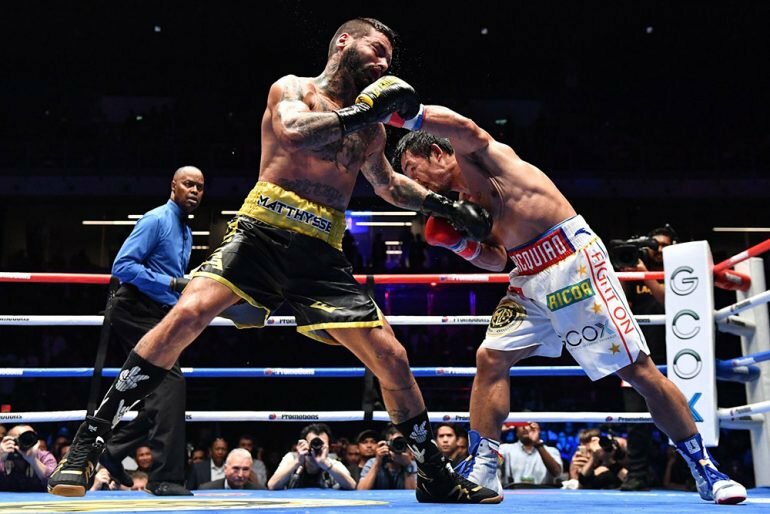 The 39-year-old took to social media to allege he is yet to be paid the broadcast fee for the US distribution of his fight against Lucas Matthysse from Kuala Lumpur, Malaysia almost two months ago. The deal is believed to be worth $1.7 million to Pacquaio, or 85% of the revenue. “Congratulations and good luck to @TRbocing and @ESPN on your 7-year partnership agreement. I know both of you have been very busy finalizing the deal,” Pacquiao posted on social media. “However, I have not received the US rights payment for my July 15 fight against Lucas Matthysse that was broadcast on ESPN plus. Pacquiao scored his first knockout in nine years when he stopped the Argentinean veteran in the seventh round of their scheduled 12 round contest on July 15 to claim the WBA “regular” welterweight title. The show was promoted by Pacquiao’s MP Promotions in association with Golden Boy Promotions, who look after Matthysse. Top Rank stepped in to handle the television distribution rights in conjunctions with ESPN’s digital streaming platform ESPN+ in the US, Puerto Rican and Canadian markets. Until earlier this year Pacquiao was promoted by Top Rank. Arum insists that his relationship with the former eight division world champion remains “very friendly”. Pacquiao remains a promotional free agent. Leading British promoter Eddie Hearn in partnership with streaming service DAZN is engaged in a two-way bidding war for his future services alongside former promoter Top Rank.